21: iSoakin' Camden, Maine, USA and iSoakin' Ithaca, New York, USA pictures posted. 6: Limited review and pictures of the Super Soaker Watch posted. 17: Submitted review for the Super Soaker Bottle Shot posted. 14: Submitted reviews for the Nerf Super Soaker Bottle Blitz, Water Warriors Goblin, Super Soaker EES Sonic, Super Soaker Aquashock Sneak Attack, and Nerf Super Soaker Point Break posted. 9: 2011 Community War, Battle Report submission posted. Whether these are the only new Nerf Super Soaker models for 2012 remains to be determined. Images and information are subject to change. 12: iSoaker.net is closing; long live WaterWar.net! 8: Beginning various updates throughout the site. 5: Awesome submitted images from Soakin' Across America posted. 19: Super Soaker SS30 original images posted. 22: First day of "Off-Season". Today also marks the end of the inaugural season of the iSoaker Water Warfare League. 23: Submitted battle report: Campsite Night Time Soak Fest posted. 22: Water Warriors Ultimate Bandit internal pictures posted. 18: iSoaker.com server upgrade completed. Site appears good after update. Super Soaker SS30 original variant images posted. 11: iSoaker.com server upgrade underway. Site may become inaccessible at times; will post again once the migration is complete. Thanks for your patience! Some statistics and mini-review of the Super Soaker Bow and Arrow posted. 10: Submitted battle report: Boys vs. Girls posted. 9 : Pictures of the Super Soaker Bow and Arrow posted. 27: Submitted pictures of the Super Soaker CPS 1200 Internals posted. 6: Battle report: The Siege of the Hill posted. 5: Battle report: Civil War posted. Submitted review of the Super Soaker CPS1200 posted. 24: On-going clean-up of the Water Warfare section. Many articles once on iSoaker.com now pushed to the iSoaker.net Wiki Water Warfare section. 20: Submitted Water Warriors Gorgon review posted. 15: Various Super Soaker Collectibles added: Super Soaker Hardee's Collectibles, Super Soaker Jack-in-the-Box Collectibles, Super Soaker Subway Collectibles, and Nerf Super Soaker Burger King Collectibles. 14: Submitted review of the Water Warriors Renegade and review of the Water Warriors Hydra posted. 11: Water Gun / Water Blaster Product Listing page updated. 10: Banzai Aqua Tech Transmorpher review posted. 3: Pictures of the Banzai Aqua Tech Transmorpher posted. 31: Pictures of the Super Soaker XP 250 posted. 18: Longer than expected delay, but the review of the Water Warriors Warlock is finally posted. 28: Somehow, forgot to post these. At any rate, pictures of the Water Warriors Warlock posted. 26: Use Firefox? Want to dress your browser up iSoaker-style? Check out these water blaster-themed Firefox Personas by iSoaker. 22: Bunch of range testing done; all 2011 Super Soakers and the 2011 Water Warriors Ultimate System blasters tested. Still need to do more range testing, but all depends on time and weather permitting. 15: Nerf Super Soaker Point Break internal pictures posted. 12: Water Warriors Ultimate Explorer internal pictures posted. 11: Water Warriors Gorgon review posted. Water Warriors Gorgon internal pictures posted. 7: Water Warriors Sphynx review posted. Super Soaker Thunderstorm internal pictures posted. 4: Nerf Super Soaker Tornado Strike review and Water Warriors Titan review posted. 1: Pictures of the Water Warriors Sphynx and pictures of the Water Warriors Gorgon posted. 29: Nerf Super Soaker Clip System Canisters review posted. 28: Nerf Super Soaker Thunderstorm review posted. 21: Happy first full day of Spring, 2011! 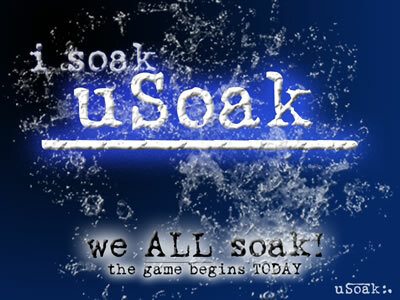 The iSoaker Water Warfare League inaugural season begins TODAY! 19: Super Soaker Evolution Tree and Water Warriors Evolution Tree updated. 14: Nerf Super Soaker Scatter Blast review and Water Warriors Gorgon (Hydro Power Version) review posted. 10: Took a little while to sort out, but all makes sense now. Pictures of the Water Warriors Sphinx (Hydro Power Version) and pictures of the Water Warriors Gorgon (Hydro Power Version) posted. 27: Pictures of the Nerf Super Soaker Scatter Blast posted. Review of the Water Warriors Ultimate Bandit posted. Review of the Water Warriors Ultimate Outlaw posted. Review of the Water Warriors Ultimate Renegade posted. Review of the Water Warriors Splat Blaster II posted. Submitted review of the Water Warriors Ultimate Renegade posted. Submitted review of the Super Soaker CPS 1200 posted. 12: Review of the Water Warriors Ultimate Vanquisher posted. Pictures of the Water Warriors Splat Blaster II posted. Submitted review of the Super Soaker Shot Blast posted. 10: Review of the Water Warriors Ultimate Explorer posted. Pictures of the Water Warriors Ultimate Renegade posted. 9: Pictures of the Water Warriors Ultimate Outlaw posted. 5: Pictures of the Water Warriors Ultimate Vanquisher posted. 4: Review of the Nerf Super Soaker Hydro Cannon posted. Pictures of the Water Warriors Ultimate Explorer posted. Beginning to migrate content in the Water Warfare section of iSoaker.com to the iSoaker.net Wiki Water Warfare section. Refining the purposes of both iSoaker.com and iSoaker.net. iSoaker.com will focus on stock water blaster information while iSoaker.net will cover water warfare and other community-related activities. 3: Happy New Year (Lunar Calendar)! Welcome to Year of the Rabbit! Pictures of an original Super Soaker Pen (1994) model posted. Submitted review of the Nerf Super Soaker Hydro Cannon posted. 1: Announcing the iSoaker Water Warfare League! See iSoaker.net for more details. 31: Internal pictures of the Nerf Super Soaker Hydro Cannon posted. 27: Shot videos of the Nerf Super Soaker Hydro Cannon posted. 23: Pictures of the Nerf Super Soaker Hydro Cannon posted. Review to come soon. 17: Submitted review of the XPloderz XBlaster 200 posted. 16: Review of the Mizumi: Oyakata posted. 15: Internal pictures of the Water Warriors Renegade posted. 14: Submitted reviews of the Super Soaker SC 500, Super Soaker SC 600, Super Soaker Big Trouble, Super Soaker Power Pak, Super Soaker XXP 275, Super Soaker WWF Stone Cold Steve Austin, Super Soaker Monster (2001), Super Soaker Monster X, and Super Soaker Monster XL posted. 10: The iSoaker.net Wiki is now live! Submitted videos of the Super Soaker XP 250 posted. 7: Submitted review of the Super Soaker XP 250 and the Super Soaker CPS 1500 posted. 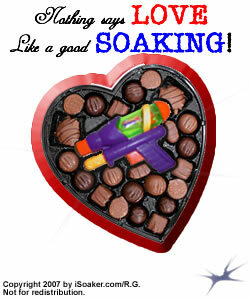 4: Early pictures and information on 2011 Nerf Super Soaker product line posted. 1: Happy New Year, 2011! A special New Year's Day iSoak'D comic strip can be found at iSoaker.net. Enjoy!